Barclaycard is piloting a self-service ice cream van, which allows customers to serve and pay for their ice cream using their contactless card. The activation called "Cone-tactless" has been developed after its research found that 40% of Brits were put off buying ice cream because of long queues. 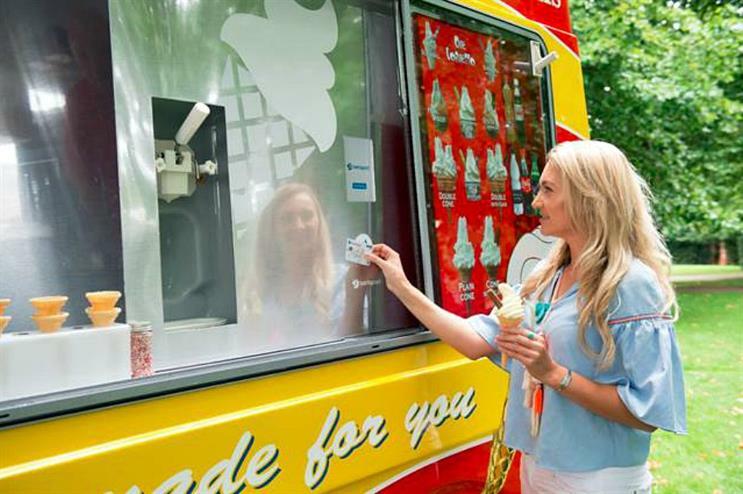 Barclaycard's self-service ice cream van aims to modernise the ice cream experience by introducing contactless payments to a typically cash-only service. Consumers can choose their ice cream using the contactless cones touchscreen, before using their contactless card to pay and enjoying their treat. Barclaycard is trialling the service to celebrate the 10th anniversary of the brand's contactless payments. The van allows for two separate queues; allowing people who just want a simple vanilla cone to receive it in less than 60 seconds. Tami Hargreaves, director of innovation and partnerships at Barclaycard Mobile Payments, said: "Ice-cream vans have long been a real staple of British summertime and to mark the 10th anniversary of introducing contactless to the UK, we wanted to celebrate this popular tradition with a prototype that gives it a modern makeover." More: Last month, Wall's launched an emoji-themed ince cream van in south London. Earlier this month, Intu unveiled a mini ice cream van in its UK shopping centres.